is reduced to half cup. Now to make it pinkish in color, add a pinch of baking soda and cook for 3 to 4 minutes at low heat. When it becomes brownish, turn stove off. Add a cup of cold water (pour slowly) and keep beating. 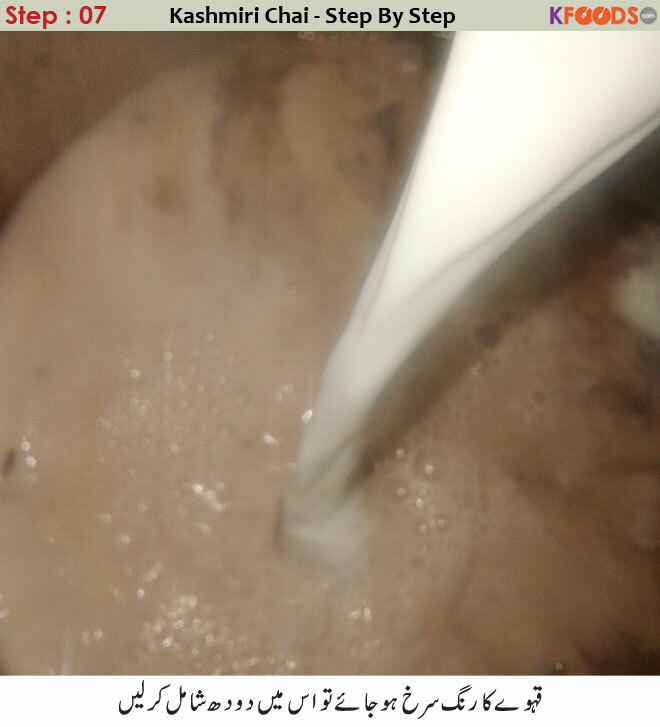 As qahwa becomes reddish, add milk and mix. Place on stove at low heat for dam. Refreshing and pleasant Kashmiri chai is ready to serve. Top with almonds, pistachios and sugar before serving. Enjoy. Today we are going to learn how to make Kashmiri tea at home. Kashmiri chai is a part of Pakistan's top food menu. Everyone loves to taste it especially in winter days. Kashmiri pink tea recipe is made using healthy ingredients which include dry fruits like almonds, pistachios etc. The tea is also known as 'noon chai' in some regions. It's pink color is so appealing that everyone rushes to grab it's delicious cup. It is very famous in all areas of Pakistan however very few know about making it. I am giving an easy recipe to make it which can help you prepare it yourself in your kitchen. 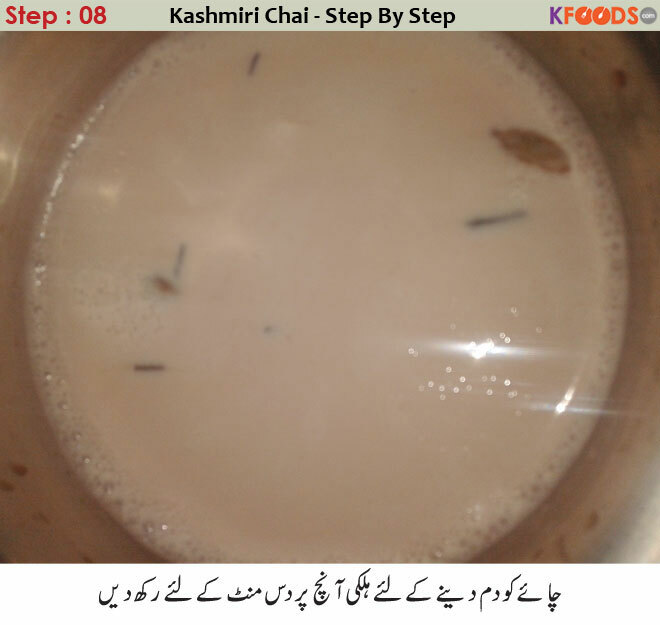 Here is the recipe of Kashmiri Chai in Urdu with step by step instructions. I’ve never tried Kashmir chai, but – OMG – this is the prettiest tea I’ve ever seen! I like the texture you’ve described and the addition of cardamom and saffron. That must be a divine drink. And of course, using some baking soda sounds intriguing – I would have never thought It might be used in making tea. Cool! Pink Kashmiri Chai Recipe Step By Step drinks and the other is the sweet one.This is the best recipe for making Kashmiri chai on the whole internet as it so easy to follow and this is very tasty as well.It was my first attempt to make Kashmiri chai my best experience is the best for me and my whole family appreciate to me for the best try to Pink kashmiri chai Recipe. Kashmiri chai is a man-made wonder that comes in 2 exciting flavors. One is the original saltish kashmiri chai that my dad drinks and the other is the sweet one. I like the sweet one which is why I prefer this one. 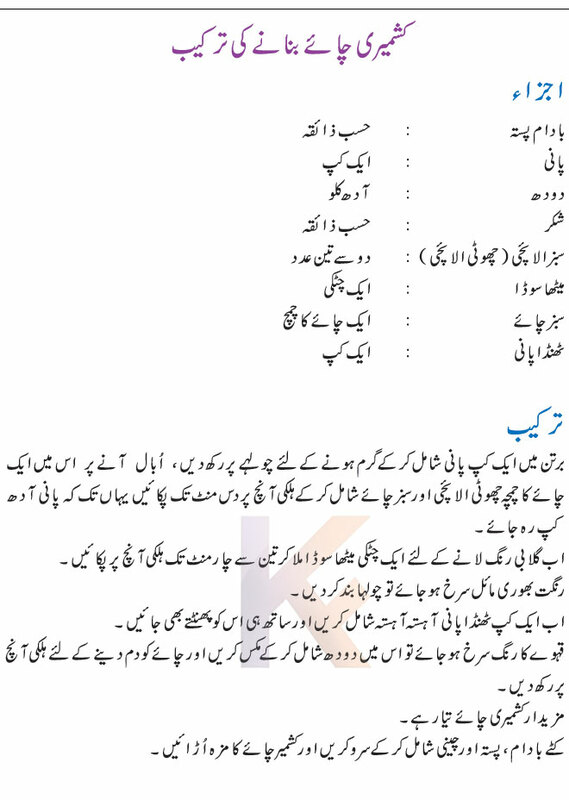 This is the best recipe for making Kashmiri chai on the whole internet as it so easy to follow and this is very tasty as well. Thanks a lot for sharing this wonderful recipe. Just a little information guys. The real kashmiri tea is not made with sugar but with salt, hence the name "Noon Chai". We in kashmir dont add sugar to our tea although the rest of the tea making process remains the same. Enjoy and lots of love from kashmir to Pakistan. my mother appreciated me a lot when I made kashimiri chae for them. I served Kashmiri chae with khatai from multan. And chicken tikkas that I made in 30 mins in oven. My mother told me that I need a bit more of focus on my recipes. This website always proves to be the best guide for me as I always find the clarification to my difficulties over here. I really liked this very much as I have the way to make Kashmiri chai right now. Thank you so much for always being there for me whenever I feel difficulty in cooking. It was my first attempt to make Kashmiri chai and indeed was a very well experience that my mother and father appreciated me a lot. Thanks a lot for this super doper recipe. I used to think that Kashmiri chai can never be made at home but you have proved me wrong. I tried the recipe. I feel proud to tell you that they were literally above my expectations. I always find this very helpful for me and same is the case with this recipe as well. My mother in law ordered me to make Kashmiri chai and I did so with the help of your recipe. We always order it at university in winters. We all friends just love it. Right now I was just wondering and I came across this lucrative recipe. I am thinking to surprise my friends by making it. In today’s breakfast, I tried this outstanding chai recipe. My mother in law was so happy to take this amazing and yummy Kashmiri chai. Thanks a lot for sharing this superb recipe over here. It is an instant way to remove your stress. I made it for my husband as he became back from the office last night. His complimentary remarks made me happy. Thank you! This is really an easy and healthy way to make healthy and hygienic food for you. I really liked it a lot. I would like to say that every house wife should try Kashmiri chai for her family. I really liked the way you explain the recipes. It was a very nice experience trying this Kashmiri chai. 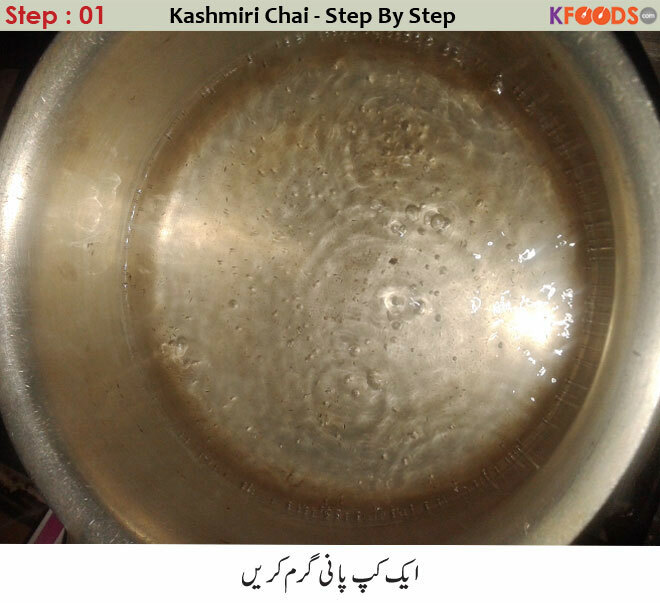 Thank you very much providing such an easy and effective way to make Kashmiri chai. 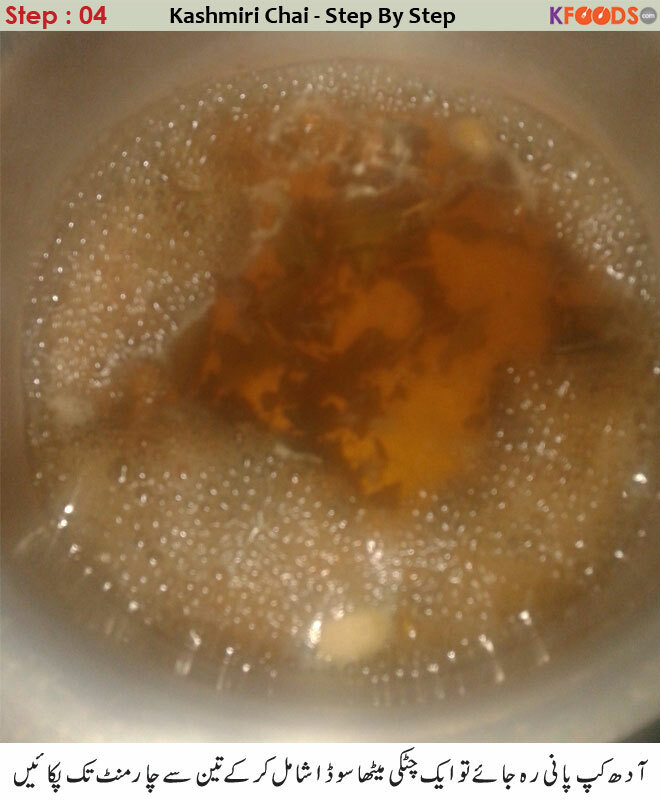 finnaly, by following your recipe I made a very nice Kashmiri chae and served it to my mother. She appreciated me. I am very happy and I will keep following more dishes. I am a foody and I always love to eat and drink anything and everything near me that I feel yummy to eat. So this Kashmiri chaiis one of those things which I always like to eat. In winter I went to my sister house she offered me a cup of Kashmiri-chai. I asked her that how you make it. She replied that I got its recipe from kfoods.com you go and also get delicious recipes. 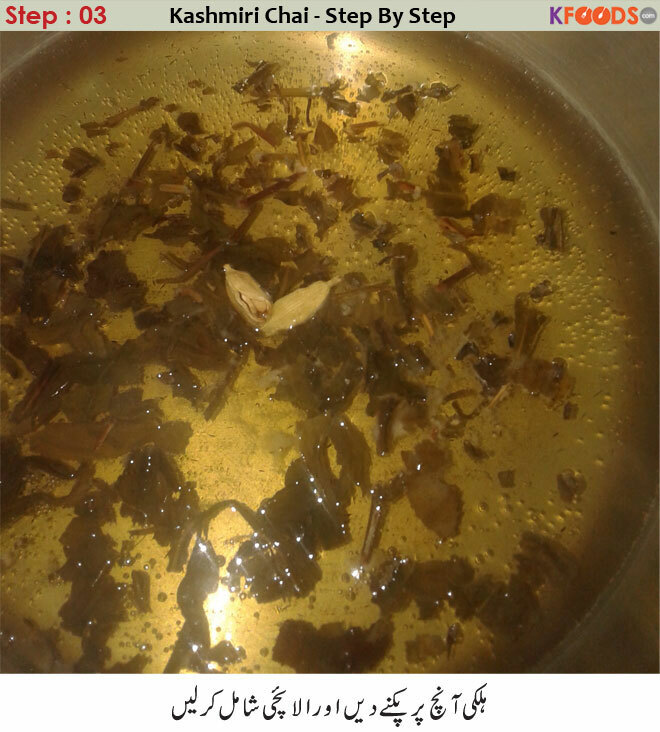 Nowadays summer has started but I am still interesting in making this kashmiri tea. I like it because of its taste and usually I make it late at night and drink it before sleeping. I tried it my home and I was very happy to know that my first experience of making Kashmiri chai at home went very well. Thanks for such an easy and understandable recipe. I made this chai for my father as he likes Kashmiri chai very much. He was so much happy when I served him this chai. He gave me a lot of best wishes and prayers. 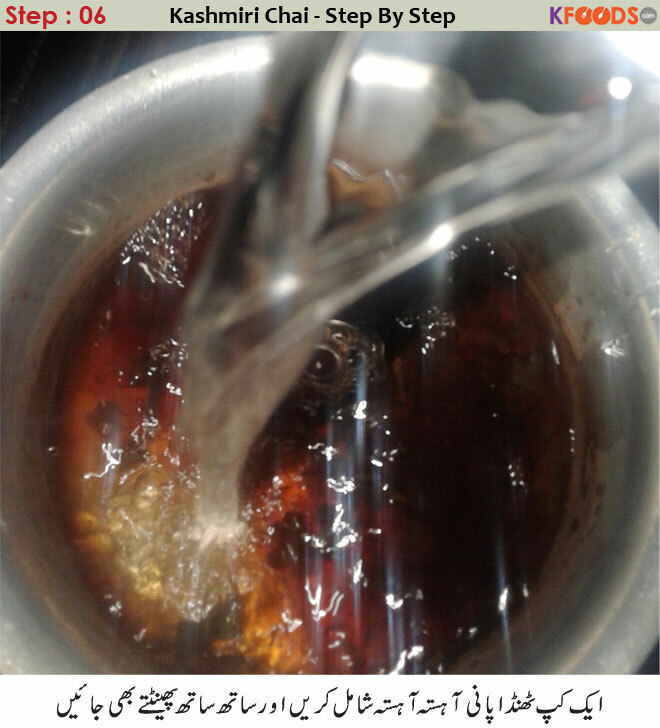 My father loves to take Kashmiri tea and my mother use to make it daily for him but I made it for him with the help of this recipe and he was so much happy to have it as I did it perfectly. This is the best recipe for making kashmiri chai on the whole internet as it so easy to follow and is very much tasty as well. Thanks a lot for sharing this wonderful recipe. 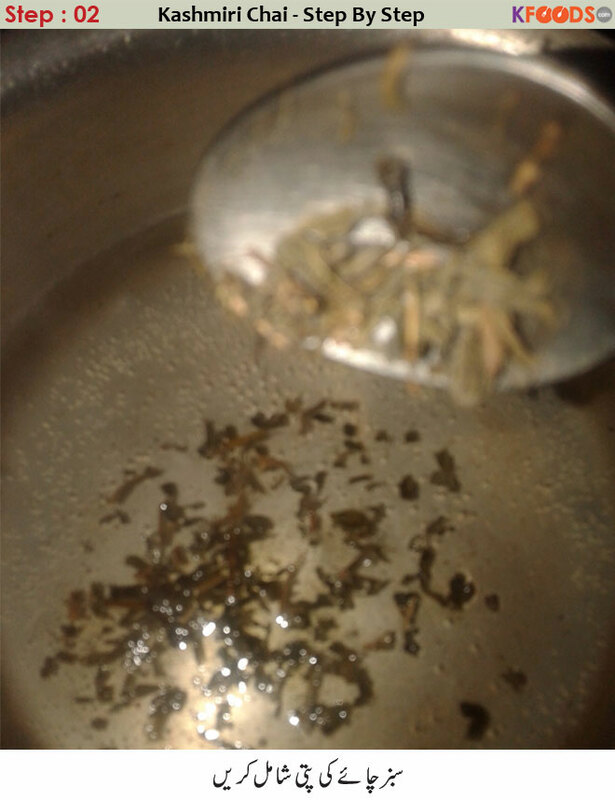 I made this tea for my father. He is from Kashmir so this is the only reason he loves to eat Kashmiri foods. Tears came to his eyes as he took its first sip as it was truly the taste of Kashmir. I made this in the last night as unexpected guests came to my house and then I served them with Kashmiri chai. They were astonished that I made so quickly for them almost in no time. Love this pink tea. its color and taste both are appealing. In Karachi, there is a tea restaurant which offers Kashmiri tea but it's far from my home. This recipe will do the trick for me. Feeling thankful to you. good work. I found this recipe the most easy one and this has motivated me to make it viewing step by step method. your this recipe is much appreciated and i recommend to post more this kind of recipes. I request post adrak kehwa. Kashmiri tea is awesome! good recipe. keep it up kfoods. I would like to get more recipes of different teas . please tell me more teas like chocolate tea etc. wow, it is my favorite. I want it now. kashmeeri chai is my favorite. I like it and I wish I can drink it whole year. I love this tea in winter. I drink it a lot. 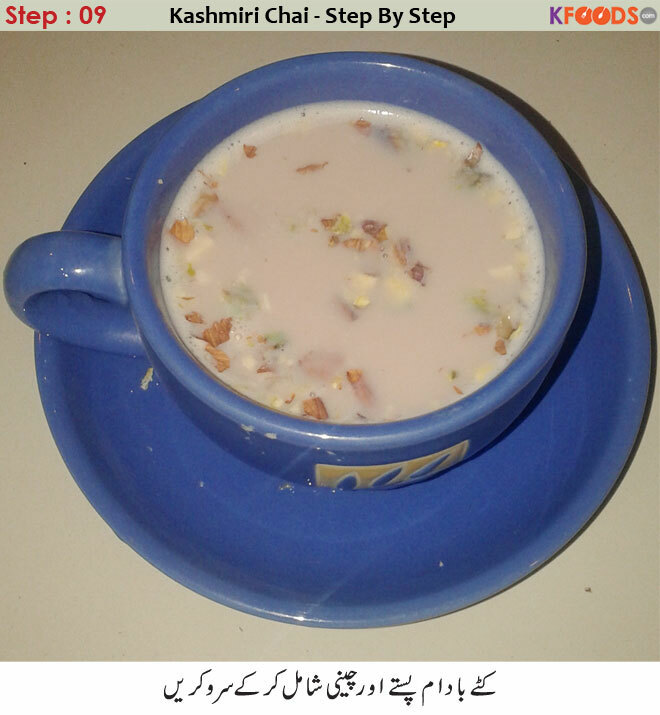 Read Blog about Pink Kashmiri Chai Recipe Step By Step and health & fitness, step by step recipes, Beauty & skin care and other related topics with sample homemade solution. Here is variety of health benefits, home-based natural remedies. 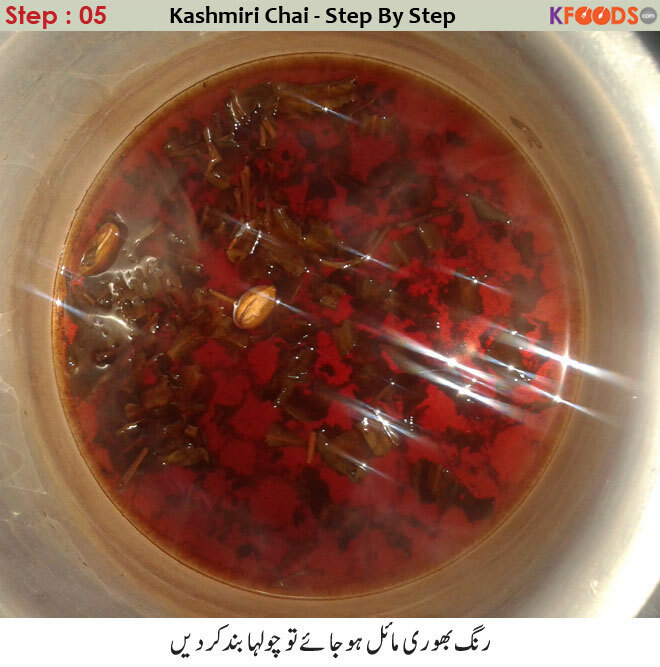 Find (Pink Kashmiri Chai Recipe Step By Step ) and how to utilize other natural ingredients to cure diseases, easy recipes, and other information related to food from KFoods.